Coyote Hills Hole 2: Really tight, uphill par 4 with hillsides on both sides. The drive is visually daunting as the safest place to hit it is close to the bunkers that hug the left side of the fairway. The approach is again uphill to a well guarded and sloping green with a false front. Coyote Hills Hole 3: This short par three is downhill and has nice views when the smog is not too thick. The green features a massive tier in the middle that essentially cuts it in half, making the shot needs more precise. 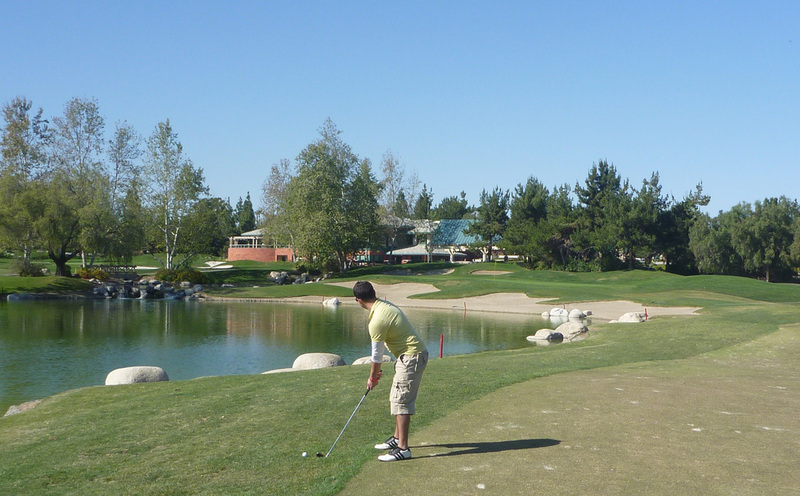 Coyote Hills Hole 6: This medium length golf hole has a fairway angling 45 degrees to the right. Thus, the short drive hit too far right catches bunkers and the long drive hit too far left finds hillside. Coyote Hills Hole 7: An obscenely elevated drive and long view of the Imperial Basin (when not too smoggy) awaits the golfer on this hole. It only takes a long iron off the tee to leave a mid iron in to the green, but the ball will be in the air so long that any small error will be magnified and most likely find the hillsides surrounding the landing area. The approach must carry the canyon and avoid the enormous and deep bunker to the right of the green. Coyote Hills Hole 8: Possibly the single best hole on the course, this long par three is tight, with a well-guarded green. Anything right will find bunker or hillside and a penalty stroke. Coyote Hills Hole 9: An elevated tee shot over the hazard presents itself to the golfer but is of no real concern. The second shot, with the large lake and bunkers short-left of the green presents the actual worry on this hole. Coyote Hills Hole 16: The second of two similar downhill par fours on the lackluster back nine, this one has the aforementioned oil derricks on it to the right. Otherwise, it is straight and short, without too much challenge.